The 13th Asia-Europe Meeting (ASEM) of Foreign Ministers will be held in Nay Pyi Daw, Myanmar from November 20 to 21. At the invitation of Aung San Suu Kyi, State Counsellor and Foreign Minister of Myanmar, Foreign Minister Wang Yi will lead a delegation for the meeting. At every stage of the meeting, he will elaborate on China's positions and proposals on international and regional situations, Asia-Europe connectivity and cooperation and relevant hotspot issues to move towards the shared goal of building a new-type of Asia-Europe partnership, jointly address common challenges, and provide new impetus for the development of Asia-Europe cooperation. Foreign Minister Wang Yi will also hold bilateral meetings with the heads of delegations of relevant countries. Prior to the meeting, Foreign Minister Wang Yi will visit Bangladesh and Myanmar on November 18 and November 19 separately where he will hold talks with his counterparts, meet with the leaders of the two countries, and exchange views on China-Bangladesh relations, China-Myanmar relations, the current regional situation, and issues of mutual concern. Q: Yesterday, US President Trump said he discussed the Korean Peninsula nuclear issue during his visit to China, and both countries agreed to reject the "freeze-for-freeze" initiative to resolve the Korean Peninsula nuclear issue. How do you understand President Trump's statement? A: China's position on the Korean Peninsula nuclear issue is consistent and clear. We are committed to realizing denuclearization of the Korean Peninsula, to maintaining peace and stability of the Peninsula, and to resolving the issue through dialogue and consultation. This "three commitments" position is well known. Meanwhile, China has been comprehensively, accurately, faithfully, and strictly implementing all DPRK-related resolutions adopted by the Security Council, and fulfilling its due international obligations. We have said many times that the essence of the Korean Peninsula nuclear issue is about security. Only by addressing the reasonable security concerns of all sides in a balanced way through dialogue can we find a fundamental solution to peacefully resolve the Peninsula nuclear issue. That is why China has raised the suspension-for-suspension initiative and the dual-track approach, which we believe would be the most pragmatic, feasible, sensible and reasonable proposal under the current circumstance. It will not only help ease the current tense situation, but also address the most pressing security concerns of all parties, create opportunities and conditions for resuming peace talks, and find a breakthrough out of the current stalemate. Here I would like to stress that suspension-for-suspension is just the first step, not the final destination. We hope that all parties give serious thoughts and favorable considerations to China's proposals. At the same time, we welcome any other proposals that are conducive to the peaceful settlement of the Korean nuclear issue. Another point I want to emphasize is that military force is not an option for resolving the issue, on which the international community has reached general consensus. Q: Zimbabwe is an important partner for China's Belt and Road Initiative on the African continent, and now it is in political turmoil. Will China adjust its investment risk assessment on Zimbabwe accordingly in light of the latest development? A: I already gave my response to the situation in Zimbabwe yesterday. China has been paying close attention to what is unfolding in Zimbabwe. We sincerely hope that Zimbabwe could maintain political stability and the relevant issues be resolved peacefully and properly. As for China's investments and projects in Zimbabwe you asked about, the friendly cooperation between China and Zimbabwe is an all-around one and beneficial to the peoples in both countries. China's friendly policy towards Zimbabwe will not change. We stand ready to develop our friendly cooperation with Zimbabwe under the principle of equality, mutual benefit, and win-win cooperation. Follow-up: There are other countries and regions along the Belt and Road that might face similar risks of regime change or political turmoil. Will China consider adjusting its investment and market expansion strategy? A: We hope that all countries enjoy stability. To assume possible political turmoil in other countries is the last thing I would want to do here. Q: You just announced Foreign Minister Wang Yi's upcoming attendance at the 13th ASEM Foreign Ministers' Meeting. What's China's expectation for the meeting? A: The 13th ASEM Foreign Ministers' Meeting will be held in Nay Pyi Daw, Myanmar from November 20 to November 21 under the theme of "Strengthening Partnership for Peace and Sustainable Development". The ASEM is an important platform for Asian and European countries to enhance mutual understanding, expand consensus, and deepen cooperation. When the international and regional landscape faces increasing factors of instability and uncertainty, the ASEM's role in maintaining regional stability and prosperity and promoting exchange and cooperation among all sides has become more salient. 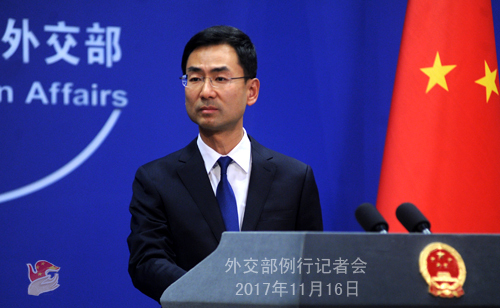 China hopes that all sides in the Asian and European regions could stick to the basic principle of mutual respect and consensus, and take this meeting as an opportunity to relay the positive message of cooperating to meet common challenges, achieve positive progress in connectivity and other areas, and inject new momentum to the building of a new-type of Asia-Europe comprehensive partnership. Q: Yesterday, Russia reached deals with Venezuela on helping the latter pay its debt. Can you tell us whether there are any discussions going on between China and Venezuela? Venezuela owes China US$ 23billion. Is China worried that it may never get the money back? A: I have answered this question twice in past two days. We have noted that the Venezuelan government has pledged to honor its debt obligations and has already taken steps to that effect. China believes that the Venezuelan government and people are capable of properly handling their debt issue. We hope that the relevant issue could be resolved by all sides through consultation. At present, financing cooperation between China and Venezuela is operating as usual. 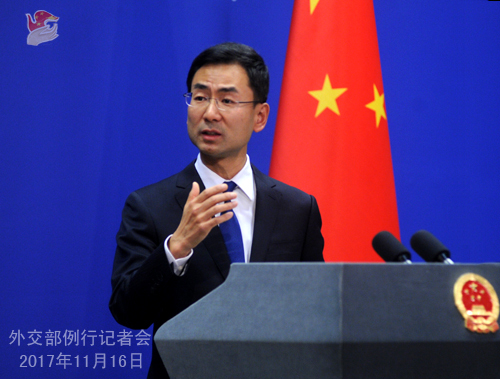 Q: Minister Song Tao will start his visit to the DPRK tomorrow to brief on the outcomes of the 19th CPC Congress. Five year ago, when the CPC sent special envoy to brief on the 18th CPC Congress to the neighboring socialist countries, the visiting order was the DPRK, Laos and Vietnam. This year, the order is Vietnam, Laos and the DPRK. What is the consideration behind this? Besides, according to the KCNA report earlier this month, General Secretary Xi Jinping expressed his hope to improve relations between the two parties and the two countries in his reply message to the Supreme Leader of the DPRK. Is Minister Song Tao's visit to the DPRK meant to improve relations? 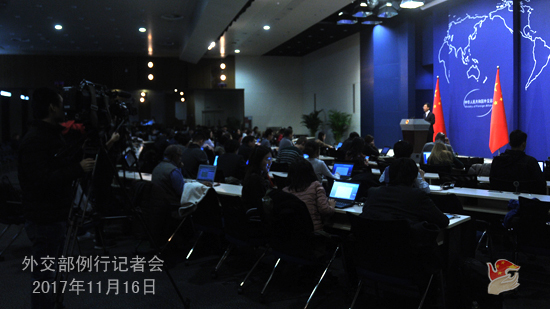 A: The 19th CPC Congress grabbed a lot of attention from the international community. It is a long-standing tradition to inform each other on Party Congress between the Communist Party of China and Communist Party of other socialist countries. Therefore, the arrangements regarding sending special envoy to brief Vietnam, Laos and the DPRK were made upon mutual consultation. You mentioned some contents in General Secretary Xi Jinping's reply message. I cannot confirm that. What I want to say is China and the DPRK are close neighbors, and developing friendly and cooperative relations between China and the DPRK serves the interests of the two countries and promotes regional peace, stability and development. Q: Today, President Duterte of the Philippines as rotating chair of ASEAN issued the Chairman's statement of the ASEAN Summit, in which no reference to concerns over China's activities in the South China Sea was made, but there are words stressing the improvement of relations between ASEAN and China. This is different wording from previous statements. What is your comment? A: It goes without saying that the contents regarding the South China Sea in the Chairman's statement of the ASEAN Summit need to faithfully reflect the real situation in the South China Sea. At present, the situation in the South China Sea is cooling down and moving towards a stable and positive direction. Therefore, what is written in the statement matches the real case in the South China Sea. Q: US President Trump said that both China and the US rejected the so-called "suspension-for-suspension" proposal. Am I right in assuming that what you said just now means what President Trump said is not true? A: You just asked a similar question with the Reuters. My answer just now is comprehensive enough. I believe you can interpret it correctly. Follow-up: So, your meaning is that short-term speaking, "suspension-for-suspension" proposal is still China's first goal, but may be discarded later? A: As I just said, the suspension-for-suspension initiative and the dual-track approach constitutes the most pragmatic, feasible, sensible and reasonable plan under the current circumstance. The suspension-for-suspension initiative focuses on finding a breakthrough to resume dialogue and consultation while the dual-track approach emphasizes the realization of long-term peace and stability on the Korean Peninsula and in the region. That is why I said the suspension-for-suspension initiative is just the first step, not the final destination, because what we seek at the end point is peaceful settlement of the Korean Peninsula nuclear issue and long-term peace and stability on the Korean Peninsula. Q: The US-China Economic and Security Review Commission of the US Congress published a report yesterday, accusing China's state media like Xinhua of involvement in spying and propaganda activities and calling on the US to register these media as "foreign agents". What is your comment? A: We have noted the relevant report. This so-called committee has always been full of prejudice on China-related issues. The content in the relevant report is sheer fiction, and the viewpoint of the report reflects their bias and stereotype against China. 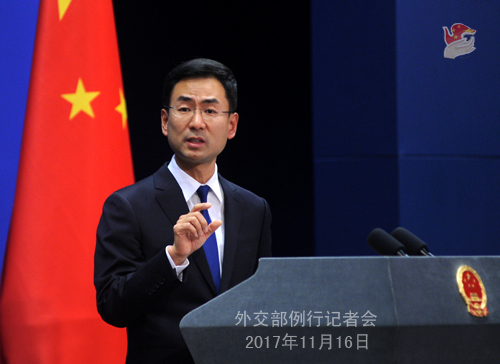 We urge the committee to stop making these erroneous words and actions on China-related issues, and really play a constructive role in promoting the development of China-US relations.